A stamped overlay offers all the aesthetic benefits of conventional stamped concrete but is applied over existing concrete. 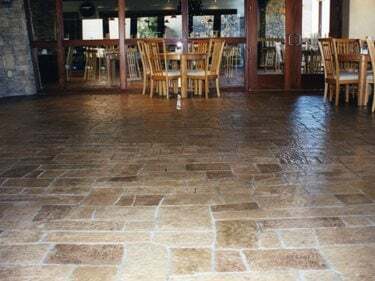 Stamped concrete overlays allow you to duplicate the beauty and texture of natural stone, brick, slate, wood, and other materials without having to replace your concrete. A stamped overlay can be used indoors or outdoors to recreate the look of natural stone, brick, slate, or even wood. ApplicationsStampable overlays can be used on new or existing concrete and on interior or exterior surfaces. They can even be applied to walls and other vertical concrete. They are especially popular for refreshing the appearance of existing driveways, patios, walkways pool decks, and floors. 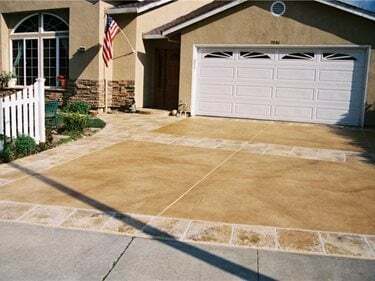 Before opting for a stamped overlay, consult a professional to determine if your concrete can be resurfaced successfully. If the concrete is in bad shape, with many cracks or severe settlement, resurfacing may not be a viable option. Bob Harris demonstrates the application of a stampable overlay over existing concrete. Learn how thickness of overlay application impacts the final square footage. How to installA stamped overlay will be durable and easy to maintain if applied properly. In order for the overlay to adhere successfully, you'll need to prepare the existing surface by cleaning it thoroughly, repairing any cracks, and profiling (which roughens the surface and helps the overlay grab onto the concrete). The overlay mix is usually applied by a gauge rake (a tool with an adjustable depth gauge for achieving a uniform topping thickness) and then imprinted with stamping mats or texturing skins. Overlay thicknesses range from 1/4 to 3/4 inch, depending on the depth of the imprint. See how to add texture to an overlay using texture skins and stamp mats. Is Your Stampable Overlay Ready to Stamp? Learn how to tell if your stampable overlay is ready to stamp or texture.